The Good News: I don't have Lupus or any other autoimmune disease - yay! My thyroid is functioning within low normal ranges, and I'm negative for yeast and thyroid antibodies. The Good News/Bad News: My overall cholesterol number is high, but so is my good (HDL) cholesterol, so the risk ratio is normal. My triglycerides (type of fat found in the blood) are high which suggests metabolic syndrome, an insulin management problem. 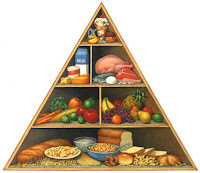 Because of the metabolic syndrome, Dr. Rothfeld suggested a low starch diet which means I have to avoid all grains and starchy vegetables (ones that grow underground). As my QiGong instructor said, it's simple but not easy! 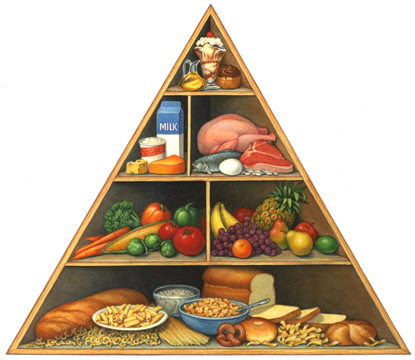 Eliminating the largest category on the food pyramid is really difficult. No more oatmeal for breakfast, turkey wraps for lunch or matzoh ball soup for dinner! The Bad News: I'm depleted in many essential bodily functions and I'm fighting toxicity and chronic inflammation. High CRP levels suggest chronic inflammation, possibly from fighting chronic viruses such as Epstein Barr or chronic toxicity (indicated by high C4A levels) from heavy metals, mold or other toxins. Dr. Rothfeld suggested a website for more information called survivingmold.com by Dr. Ritchie Shoemaker. I took a Functional Acuity Contrast Test (FACT) vision test that indicates neurotoxins are interfering with my brains ability to make certain distinctions. Other than serotonin, all my neurotransmitters, such as norepinephrine, dopamine and GABA, are extremely low. When Dr. Rothfeld said that my brain is deranged, I wasn't sure if I should be insulted! Those "out of range" neurotransmitters put my adrenals into flight or fight mode which is highly stressful on my system. As you can see by the chart, my cortisol output is basically flat-lined compared to normal ranges which are high in the morning and drop off by night time. That makes me fatigued in the morning and too wired at night, interfering with sleep.